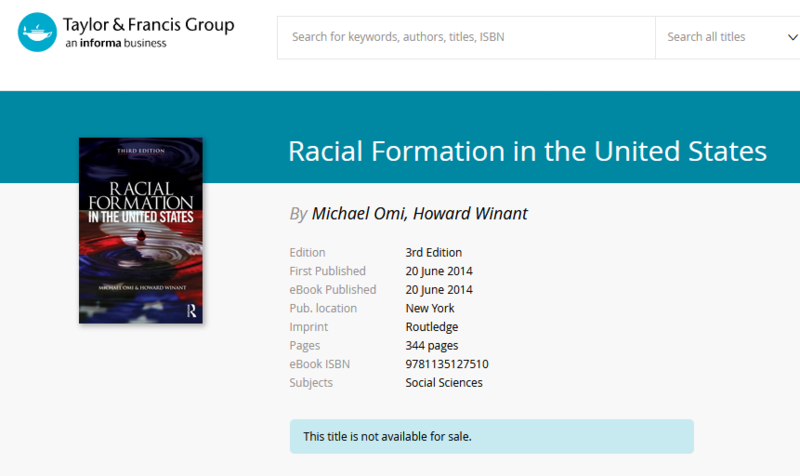 Occasionally, on the Taylor & Francis ebook site, you will see a title that says “This title is not available for sale” and you will not have access to the full text. We apologize for any confusion this causes. We try to only list in the Catalogue and Summon ebooks that have full-text access. However, the title list we use is not pre-sorted to identify the “not for sale” titles from Taylor & Francis (this site also includes CRC Press, Routledge and several other imprints). so, we do not know which of the over 120,000 ebooks have been withdrawn until someone comes across this message. If you find a T&F ebook like this, please report it via our Help Form and we will remove it and advise on an alternative source (if available) for the title.